Trade Me, New Zealand's largest buying and selling website, has added Google Maps and Street View to its property searches. Now when you search for a property on Trade Me you can view the location of the property on Google Maps and you can view the property and surrounding area on Google street view. 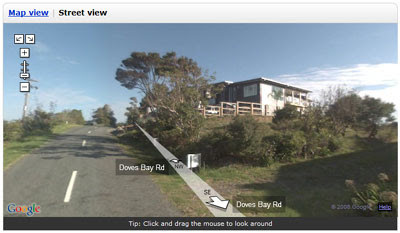 Trade Me has created a well designed tabbed interface to the map and street view, making it easy to switch between the Google Map and the street view of the property. The following street view galleries have all begun to add fun sightings from New Zealand's new street view imagery. Google Sightseeing have discovered this nice view of Mount Doom from The Lord of the Rings. Street View Gallery found this giant sheep. 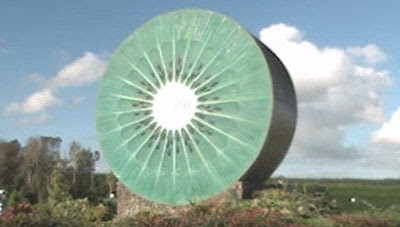 All in all street view in New Zealand brings you a big slice of kiwi. ..this is really going to challenge tourism in NZ..have you noticed how many 1000's of kilometres you need to travel through barren farmland before you hit something nice, like forest or a beach. People in Europe seem to think NZ is lush green forest - but in fact, it's green, but grass green - all the tropical forest has been cindered or turned into Devonport Villas as of last century!